The only ghosts I've ever seen are small versions that ring my doorbell on Halloween eve and cry, "Trick or Treat." 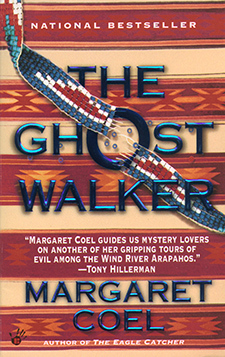 I'm not even sure I believe in ghosts, and I never expected to write a ghost story, yet that is what I did in The Ghost Walker, the second novel in my Wind River mystery series. The idea came the way most ideas come—out of the blue. Like ghosts, I suspect. Manifesting themselves when you least expect them. Anything might summon an idea for a novel: traces of sadness in an old man's face, remnants of laughter from a passing car, the startled look of a kid who drops his ice cream cone, a brief newspaper article, snatches of a conversation. And there you are—gob-smacked by an idea that explodes into a story that you know you must write. Which is how the idea for The Ghost Walker hit me. 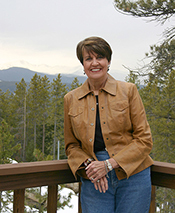 My first novel, The Eagle Catcher, had just been published, and I was on the Wind River Reservation promoting the novel at book signings and get-togethers. I remember several Arapaho friends suggested we meet for dinner one evening at a local restaurant. It was close to Halloween, so it probably wasn't unexpected that the conversation turned to ghosts. Someone mentioned a priest they knew who had been at St. Stephen's Mission (St. Francis Mission in my novels) several years earlier. Highly educated, intelligent, altogether rational, this priest was hardly the type to see ghosts, even though, my friends insisted, he had seen a ghost. They all knew the story, and they jumped in with various versions and embellishments. The basic story went like this: The priest (like Father John O'Malley in my novels) loved the Arapaho people and was beloved by them. Sensitive to their spiritual beliefs, open to possibilities he had never before encountered, willing to learn about things he had never imagined, he made friends easily on the reservation, and he served at the mission for several years. At one point, he was called away for a short time. When he returned, he drove down Seventeen Mile Road toward the mission, and as he passed Great Plains Hall, he spotted rows of pickups and cars in the parking lot. He wondered what was going on. The hall was then, and still is, a place where people come together for everything from tribal meetings to powwows, craft fairs, celebrations and funerals. Walking toward him on the side of the road was an Arapaho man in blue jeans, plaid shirt and cowboy hat. The priest immediately recognized one his parishioners, a man who had welcomed him to the mission when he first arrived and explained many things about the Arapaho Way. Over the years, they had become good friends. The Arapaho smiled and waved. The priest waved back and drove on. When he reached the mission, he learned that his friend had died two days earlier. The traditional Arapaho burial services were even then taking place at Great Plains Hall where the Holy Old Men were preparing the dead man for his journey to the afterworld. The ancient ritual of prayers and blessings included painting symbols on the body with sacred red paint that would identify the dead man to the ancestors, who could then recognize him and lead him into the afterworld. This sacred burial ritual must take place within three days of death. Otherwise the dead person will be condemned to walk the earth, alone and forlorn, looking for the way to the afterworld. The priest understood that the ancient rituals were still taking place inside Great Plains Hall, and his friend had not yet gone to the ancestors. While his spirit waited to begin the journey, he had taken a few minutes to walk along the side of the road and wave to him. He had come to tell him goodbye. 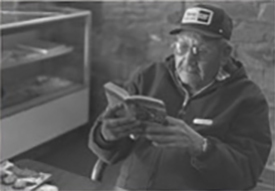 Arapaho elder, Tommy White, reading The Ghost Walker. As the conversation unfolded around me, different people remembering different details, I could sense the germ of an idea rooting itself in my imagination. Strange what happens when an idea takes root like that. The rest of the story—the entire novel—has a way of filling in around the edges, blossoming with characters and incidents, stretching and growing into a complete story. When we parted that evening, I thanked my Arapaho friends for the gift they hadn't realized they had given me. They had told me a ghost story, and I had received a novel. 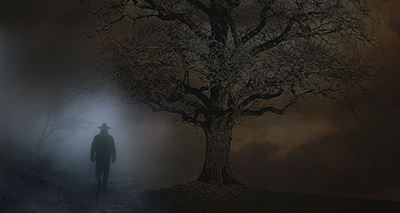 The next day I drove home, sat down at my computer and began writing The Ghost Walker. Read more about the Wind River Mysteries.